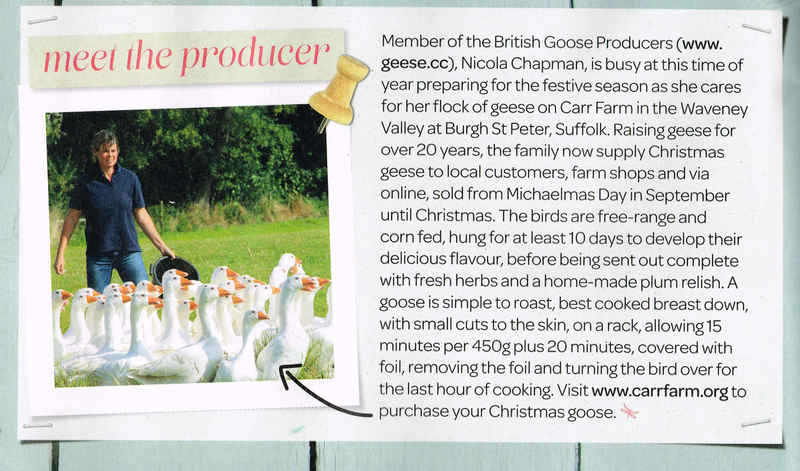 See the little feature on Carr Farm Geese under “Meet the Producer” in Landlove Magazine’s Christmas edition. The magazine champions seasonal produce each month with their “what to eat now feature”. Featured Goose Producer 2014 ! We were pleased to be chosen as the 2014 featured goose producer on the British Goose Producers Website. This afternoon we chatted about keeping geese and the Christmas goose on Leslie Dolphins Radio Suffolk afternoon show. We talked about the growing popularity of Goose at Christmas, the daily routine of keeping geese, cooking Christmas Goose on the big day and a little about life here on Carr Farm. A great Christmas Goose feature this week in the Farming Insight supplement of the EADT. Following a visit to Carr Farm Geese this years geese modelled for some photos and we told our story……. Inspired into taking a gander.